Max Pzoras is the poster child for the American Dream. The child of Greek immigrants who grew up in a dangerous New York housing project, he triumphed over his upbringing and became a successful Wall Street analyst. On the frigid December night he's involved in a violent street scuffle, Max begins to confront questions about suffering and mortality that have dogged him since his mother's death. His search takes him to India, where he encounters a mysterious night market, almost freezes to death on a hike up the Himalayas, and finds himself in an ashram in a drought-stricken village. As Max seeks answers to questions that have bedeviled him-can yogis walk on water and live for 200 years without aging? Can a flesh and blood man ever achieve nirvana?-he struggles to overcome his skepticism and the pull of family tugging him home. In an ultimate bid for answers, he embarks on a dangerous solitary meditation in a freezing Himalayan cave, where his physical and spiritual endurance is put to its most extreme test. 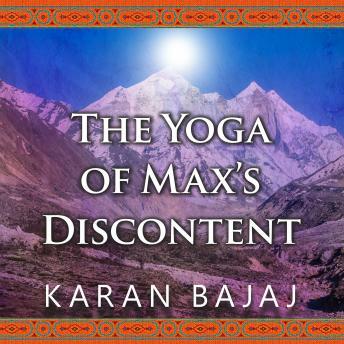 By turns a gripping adventure story and a journey of tremendous inner transformation, <I>The Yoga of Max's Discontent</I> is a contemporary take on man's classic quest for transcendence.